Cholangiocarcinoma (CC) is a biliary duct cancer that is highly unresponsive to current therapeutics. Previous work suggests that WNT signaling contributes to liver fluke-associated CC development; however, it is not known if WNT signaling promotes spontaneous disease. Luke Boulter and colleagues at the Medical Research Council evaluated human specimens from patients with spontaneous CC and determined that the WNT ligand WNT7B is overexpressed in CC compared to patient-matched non-cancerous tissue. Moreover, WNT7B expression co-localized with CD68+ stromal-derived macrophages. In murine and rat models of CC, WNT7B was upregulated in concordance with CC growth. Depletion of macrophages or pharmacological disruption of WNT signaling decreased WNT7B expression and markedly reduced tumor volume and mass in both xenograft and chemical-induced CC models. In the accompanying Commentary, David Virshup of Duke-NUS remarks that these results support further exploration of the WNT pathway as a therapeutic target for the treatment of CC. 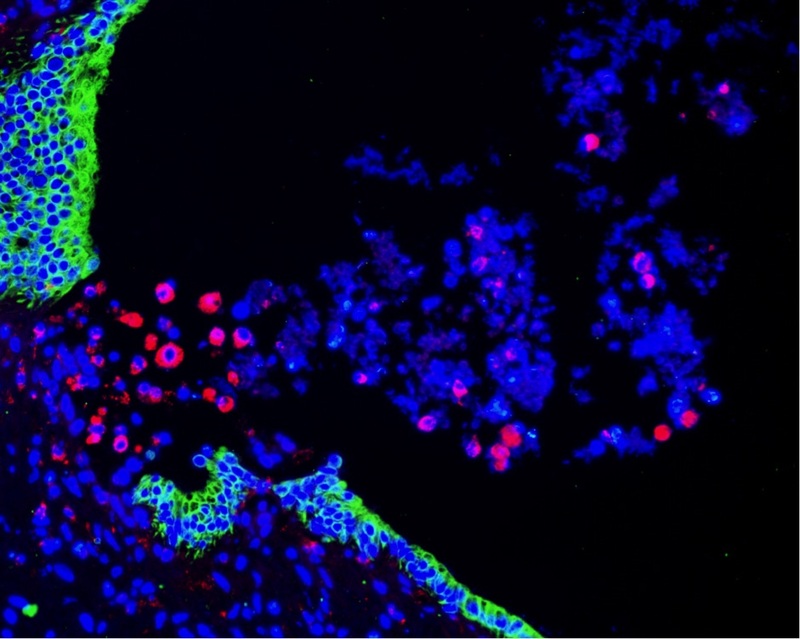 The accompanying image shows a cancerous human bile duct (stained for KRT19, green) being infiltrated by cells that begin to express the macrophage differentiation marker CD68 (red) as they move into the tumor. Citation Information: J Clin Invest. 2015;125(3):1269-1285. https://doi.org/10.1172/JCI76452. Cholangiocarcinoma (CC) is typically diagnosed at an advanced stage and is refractory to surgical intervention and chemotherapy. Despite a global increase in the incidence of CC, little progress has been made toward the development of treatments for this cancer. Here we utilized human tissue; CC cell xenografts; a p53-deficient transgenic mouse model; and a non-transgenic, chemically induced rat model of CC that accurately reflects both the inflammatory and regenerative background associated with human CC pathology. Using these systems, we determined that the WNT pathway is highly activated in CCs and that inflammatory macrophages are required to establish this WNT-high state in vivo. Moreover, depletion of macrophages or inhibition of WNT signaling with one of two small molecule WNT inhibitors in mouse and rat CC models markedly reduced CC proliferation and increased apoptosis, resulting in tumor regression. Together, these results demonstrate that enhanced WNT signaling is a characteristic of CC and suggest that targeting WNT signaling pathways has potential as a therapeutic strategy for CC. Citation Information: J Clin Invest. 2015;125(3):975-977. https://doi.org/10.1172/JCI80819. Cholangiocarcinoma is a relatively rare cancer of the biliary ducts that is highly refractory to treatment. The factors that drive cholangiocarcinoma are poorly understood, though chronic liver fluke infection is a risk factor for disease. In this issue of the JCI, Boulter and colleagues demonstrate that the WNT/β-catenin signaling pathway is upregulated in patients with sporadic cholangiocarcinoma. The authors determined that macrophages generate WNT ligands in cholangiocarcinomas and depletion or inhibition of this cell population in animal models of cholangiocarcinoma reduced tumor burden and proliferation. Moreover, pharmacological inhibition of WNT secretion or β-catenin activity was efficacious in animal models. Together the results of this study suggest that targeting WNT has potential as a therapeutic strategy for cholangiocarcinoma.